I took an impromptu solo trip to Switzerland in the middle of December when I caught a cheap round trip flight for $380 (kudos to IcelandAir). A place that I already had high expectations for due to photos on Instagram and Pinterest, Switzerland did not disappoint. This is the 2nd country (first was Italy) that made me say “I could live here”. Getting Around: When I landed in Zurich and stepped into the airport station, I knew I was in for a great experience. As a New Yorker, I’m no stranger to taking local trains. I try my best not to compare places, but I could not help but notice how clean the train tracks and platforms were. I’ve taken the train in many countries and I must say Switzerland has the most clean, comfortable and efficient rail system thus far. The train also has a restaurant in one of the cars. If you would like to make a purchase on the train, you must use cash only in order to pay (either Swiss Francs or Euros). Depending on how long you are visiting and how many places you’re going I recommend buying a Swiss Travel pass. I purchased a three day pass for $225 using the SBB app (free download on the iPhone). I thought this was expensive but when I priced out the train rides individually and taking into account the efficiency and comfort, I realized the price was fair. I would note that Switzerland is not a very budget friendly place especially when it comes to transportation so plan accordingly. I have to also highlight how much I loved the Swiss Rail app (SBB). This app was a huge help and I wish we had something like it at home in New York City. It tracks your train rides real time and tells you exactly when to get off, which platform and which direction to walk in. It also stores your train pass as a PDF so you can show the attendant while on the train as opposed to having to scan a card when you enter the station. 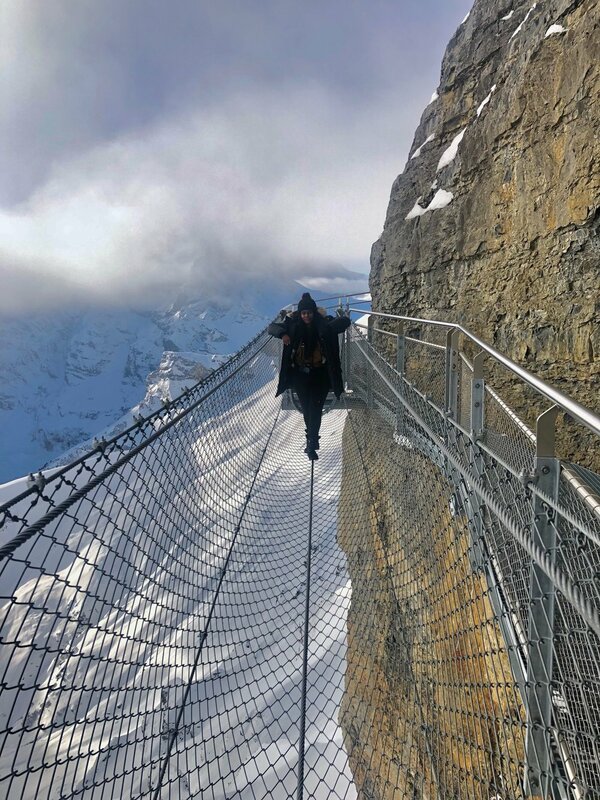 The Thrill Walk: While browsing Facebook one day, I came across a video of this excursion of people walking across a bridge-like structure attached to a mountain. I had no idea what it was or where it was but after seeing it, I said “I have to do that”. So I did ! I was a bit confused on how to get there at first, but because of the Swiss Rail App, it was a breeze. 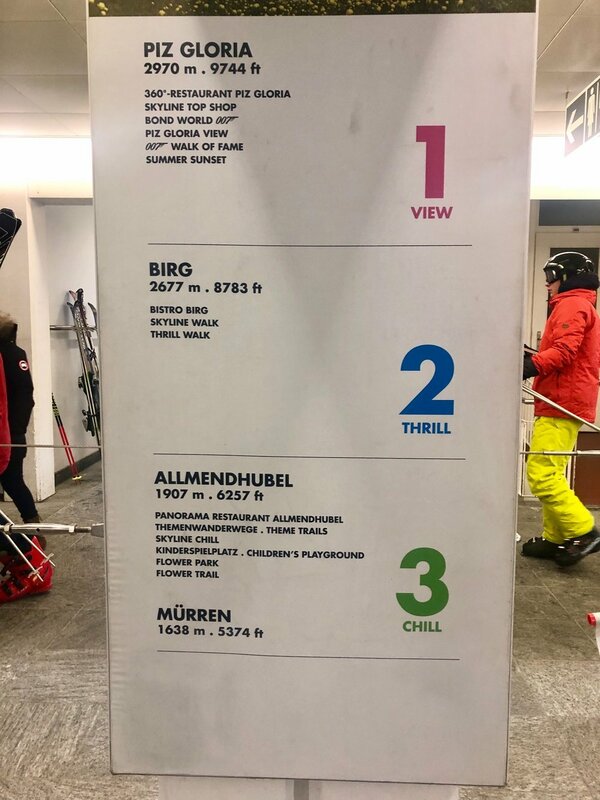 Another good thing about purchasing the Swiss Pass is that it covers entrance fees in many tourist attractions and the Thrill Walk at Schilthorn is included which saved me about $60. I arrived here from Spiez by taking the train to Interlaken and transferring to another train to Lauterrbrunnen. 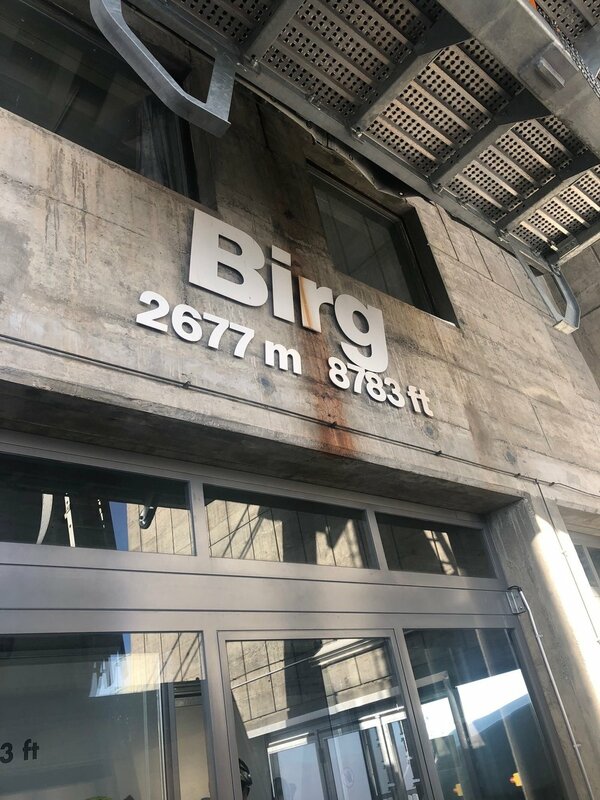 From there I took a local bus (also covered by the Swiss Rail Pass) to Schilthorn and arrived at the thrill walk by cable car. As an adventure seeker I loved the Thrill Walk but I must say it’s not for anyone who has anxiety or a fear of heights. For my fellow thrill seekers, you’re welcome ! Calling all adrenaline junkies! 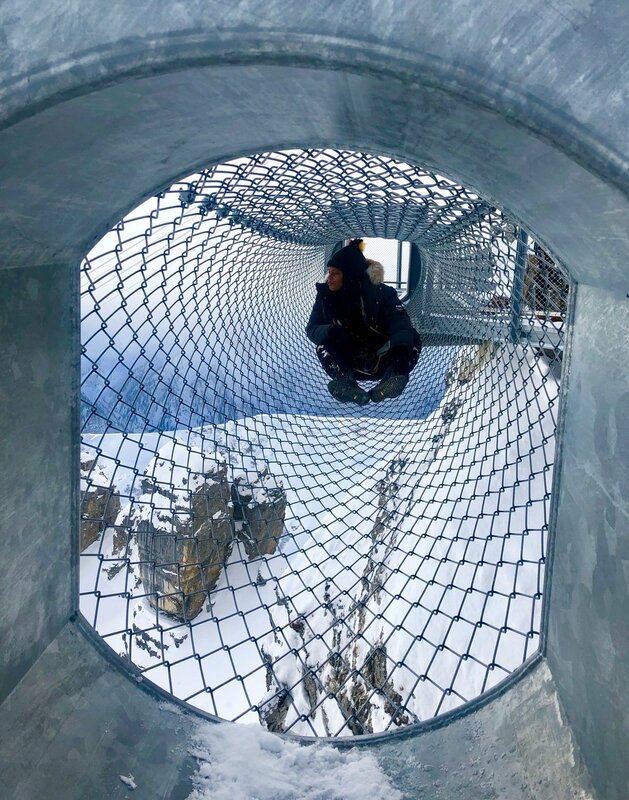 If you're ever in Switzerland Adrenaline, head to the Schilthorn summit in the Bernese Oberland in Switzerland, to take on The Thrill Walk. The Views: There’s something about mountain views that brings a sense of calmness to me. You can get some great views of the Swiss Alps just about anywhere. However it’s best to see them outside of the main cities. I loved my view from my hotel in Spiez (checkout my hotel experience blog) and the surrounding area. You can also get some great views of them from Lauterrbrunen and while riding the trains. While exploring the area of Lake Thun (pronounce ‘tune’), you can hike to one of the suspension bridges in Leissigen. As a thrill seeker, I love to do random things while suspended who knows how many feet in the air. Zurich: Taking a bus tour of Zurich was a great choice. I got to see the highlights of the city without having to maneuver through crowds in the cold. It’s a change of pace compared to Spiez, but I still recommend spending some time in the capital city. Whether you want to walk around and admire the architecture, do some shopping, have some Swiss Chocolate, or grab a coffee in one of the countless cafe’s, there is something in Zurich for you to enjoy. For a city bus tour of Zurich I recommend Best of Switzerland tours. If you’re visiting in the month of December, drop by the Christmas market in Zurich main station. Baden: Only 15 minutes away from Zurich main station where you’re close enough but far enough at the same time, Baden gave me the perfect colonial vibe I was looking for. While walking around at night I came across a cozy yet delicious Italian restaurant called Il Brunnello. Being a fan of Italy and it’s food, this place did not disappoint. Take a stroll through this lovely area if you want to venture away from Zurich but don’t want to be too far. I stayed at Limmathof Baden and had a great stay (hotel experience post coming soon). To wrap up, my short and sort of last minute solo trip to Switzerland was a success. Even though I barely scratched the surface , I still had an amazing time and I am looking forward to do more in here in the near future.